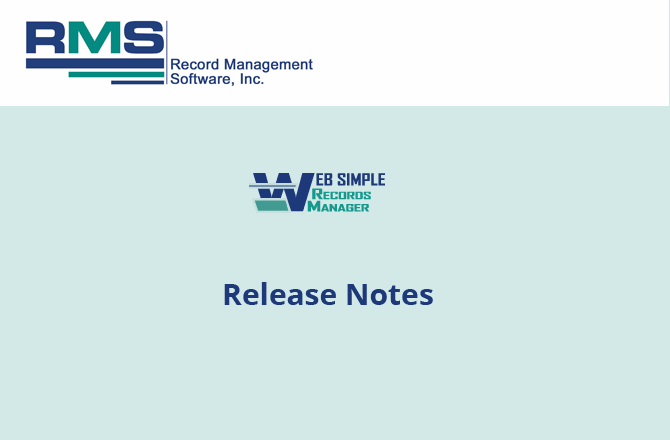 The following fixes and enhancements were implemented in Web Simple Records Manager Version 4.0.3 released on 2/13/2009. The box list now includes a display of the location field. There is a new location search in the box list, box edit screen, mass change box screen, and the screen for selecting individual boxes. There are now options to search for a location to limit the location pull down list. The Box edit screen has been augmented by a wider pull down for record title code and an alphabetical pull down of departments. The Box report has been enhanced. It now contains the header on all pages. It also has a new parameter of location ranges. The File report has been enhanced. It now contains the header on all pages. Also in list format the header ‘Expanded Text’ has been dropped for files without expanded text to condense the report. The Box report in fancy format has been revised with smaller font structure making the report tighter and allowing more information on each page. On the Main Tabs page a link to the Web Simple user guide has been added. The upload of the Portable Bar Code Scanner move box routine now implies the location using the previous location. The Portable Upload report now correctly displays the number of successful and error items. When adding a duplicate file number, you now have a third choice to cancel and not add the duplicate file to Web Simple. In the Box and File lists the To Whom filter has been corrected to allow proper use of wildcard search. The Retention reports have been revised to display the total number of years and months when the values for office years/months and center years/months are left at 0. The destruction process has been reprogrammed so that subsequent destruction of a box previously destroyed only list the box once on the Boxes Destroyed report.